"Now Learn How to Raise Meat Chickens, AND Pigs on Pasture, AND an Organic Market Garden"
With careful planning, even the smallest farm can support a number of diverse enterprises. As long as they do not directly compete for your time, space, facilities and assets, you can create a number of complementary ventures on your small farm. That's the way we work at New Terra Farm; our three main enterprises - the organic market garden, our meat bird flock, and pigs on pasture - all work together to actually improve our garden soil and our pastures, as well as our cash flow. So we put these three farm businesses together in the "Farm in a Box" Profitable Organic Farming Pack, only from New Terra Farm. 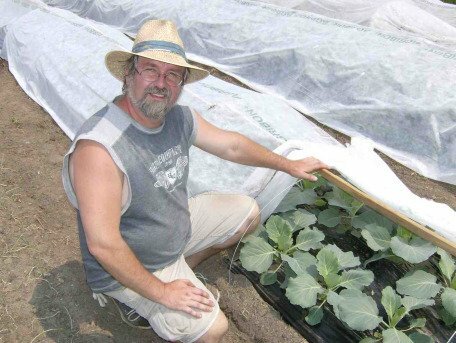 Market gardening, pastured pork, and raising meat chickens are great complementary businesses for your small farm. The chickens can be rotated through your garden and pasture to help clean up weeds and pests, and add some 'natural fertilizer'. The pigs will 'root up' your garden in the spring, and clean up garden waste in the fall. That's why we put these all these books and bonuses together in our Farm in a Box. This is a great value. These farm books and tools sell separately on my site for $84.50. But you can get them ALL TOGETHER nowfor just $47, only from New Terra Farm. You save $37.50! Yes, this means you are getting the Bootstrap Market Gardening Pack FREE! Get all these books and ALL THE BONUSES in our Farm in a Box Profitable Organic Farming Pack. This is the best price you will see for these books and valuable bonuses, available only from New Terra Farm. These books are not 'theory' or junk that was downloaded from the Internet. Every one of these information tools was created by me, here on the farm. They are based totally on my experience and learning acquired over 10 years of operating New Terra Farm. Take advantage of my experience in starting your own small farm. And, like always you can buy my books securely and risk-free with my one-full-year, no-questions-asked, money-back guarantee. My Personal Guarantee: Buy any of my books and and study them for up to one full year. If you aren't absolutely excited and already planning your own small farm business, or are unsatisfied for any reason, I'll return your payment, no questions asked. 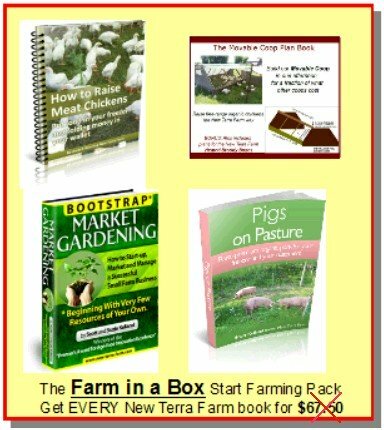 The Bootstrap Pack, How to Raise Chickens, the Movable Coop Plans, and Pigs on Pasture are e-books. When your purchase is complete you will be taken to a secure site to download the Start Farming Pack including all the bonuses right away; you can get started farming right away, no waiting for a physical book to be shipped. p.s. You may be wondering why I am offering such a big discount on these books. Here's the reason: One of my goals here on the farm is to encourage new organic growers whenever I can. For example, I have supported and trained and helped launch two other organic farmers in my area. So here's the deal: I give you a nice discount on the books, and you contact me and let me know how it goes with your own Bootstrap Farm. No thanks, I don't want the Complete Start Farming Pack, with the FREE BOOK and all the other bonuses for $47. Just give me How to Raise Meat Chickens and the Movable Coop Plan book for $27.50.